« Auction Watch #49 – Belt 1 and Belt 2? Memories are funny things. The passage of time can cause them to change or even be completely forgotten. There are some memories that don’t fade. They act as tent poles to the story of our life. These memories are called “flashbulb memories.” They are vivid and can seem like they happened only moments ago. For Tyler Larkins finding a #153 figure as a child is a flashbulb memory. Tyler was mesmerized by the number of M.U.S.C.L.E. figures as wells as the wonderful variety of figures. 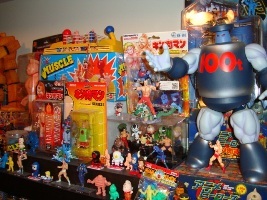 His love of WWF wrestling only increased his infatuation with the intergalactic wrestlers. 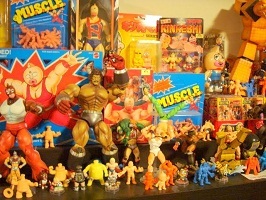 However, Tyler was not alone in his love of M.U.S.C.L.E. figures. He remembers the figures permeating the entire neighborhood. 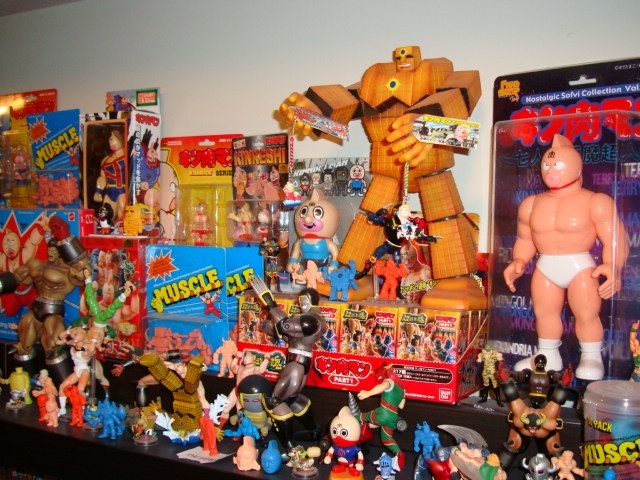 Even today when Tyler looks at some figures he will get a rush of memories about specific childhood friends and their various sandboxes or basements. 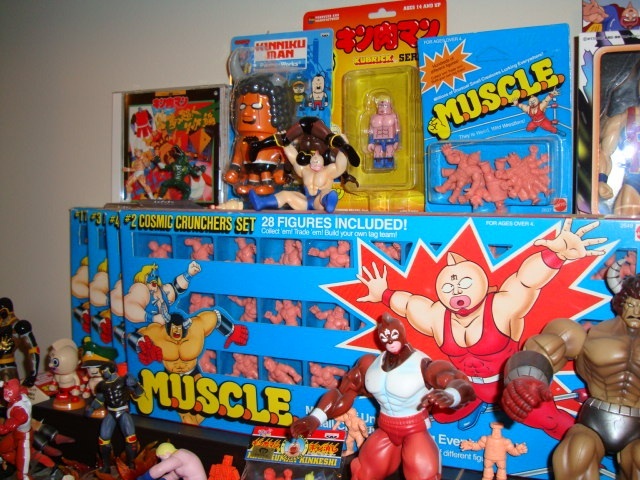 Tyler’s collecting, trading, and freezing M.U.S.C.L.E. 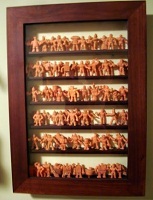 figures in water with his brother may have started when he was eight or nine years old, but M.U.S.C.L.E. has been a consistent part of Tyler’s life. When Tyler started dating his future wife in college, M.U.S.C.L.E. was a part of it. 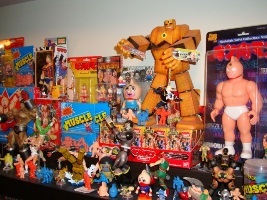 She is originally from Tokyo and knew more about the origins of his M.U.S.C.L.E. collection than he did. Tyler believes that having his wife come from such a toy, anime and manga filled culture helped her in being very open to and supportive of his collecting. With the help of his wife Tyler’s M.U.S.C.L.E. 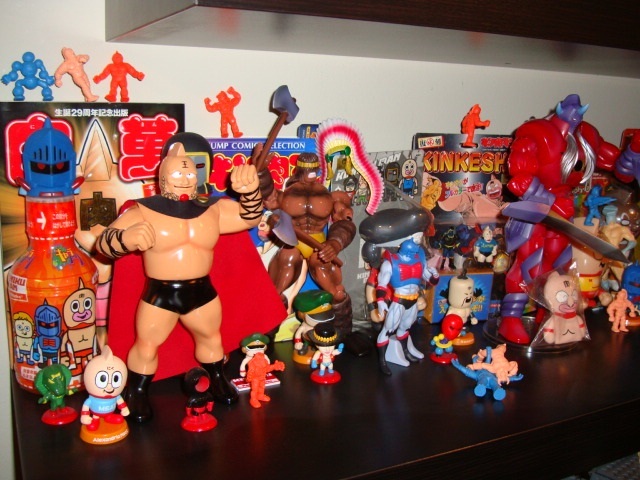 collecting grew to include Kinnikuman collecting. 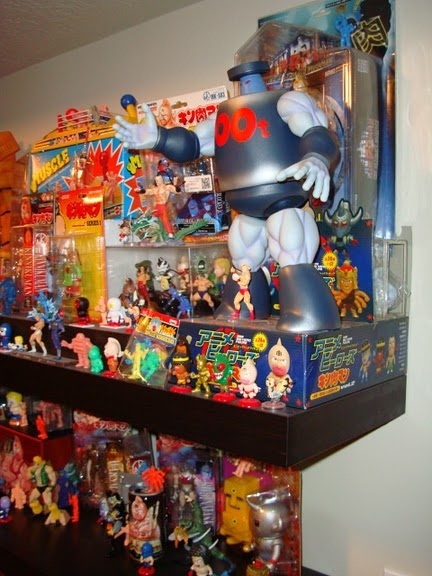 And while the scope of his collecting grew, the focus is forever evolving. 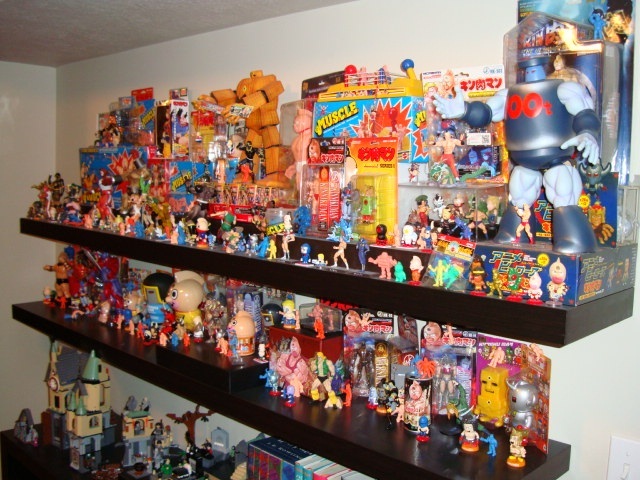 With such a diverse collection it might be hard for some collectors to select one piece of their collection which they love above all others. 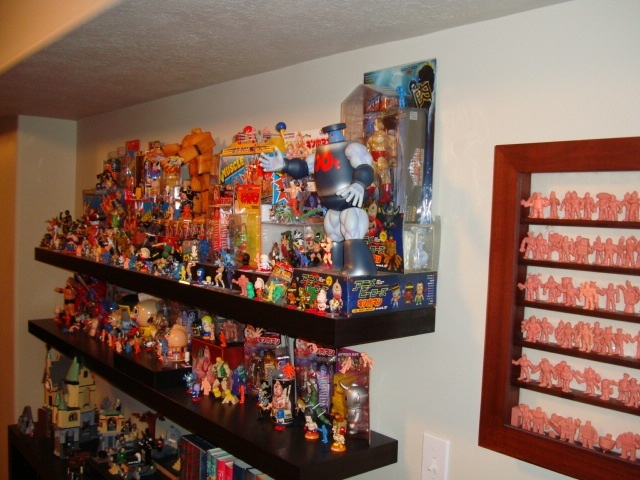 Tyler is not like other collectors in that regard. He knows exactly which piece is his favorite part of his collection. 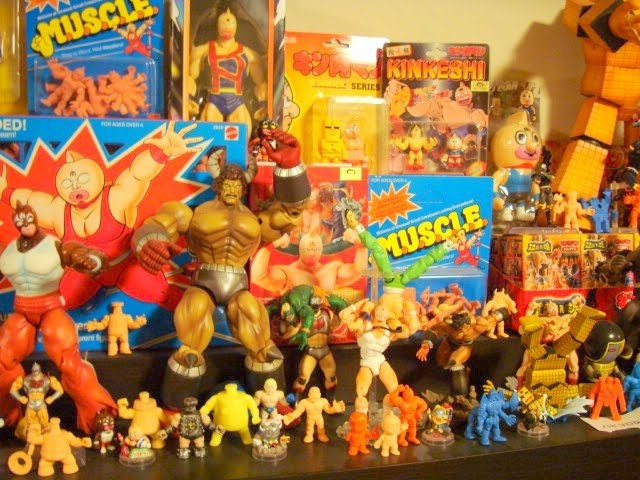 Even with such a unique and important part of M.U.S.C.L.E. history in his collection Tyler still has pieces he would like to discover. The first is the Flesh version of the M.U.S.C.L.E. poster, but even more desirable for Tyler would be a 10-pack with an easily observable #153 figure. He would also love to find a complete, Flesh 10-pack display. Tyler’s collection may grow, contract, and almost continually change but there are some constant aspects to it. The first is that Tyler is very particular about his figures. Broken and/or dirty figures have no place in his collection. Especially frustrating to him are figures with writing on them or figures that have been damaged by a child biting on them. 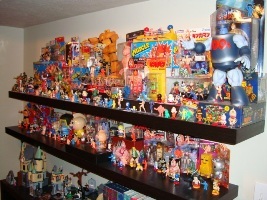 Because his collection has a certain fluidity to it Tyler has a rather interesting approach to tracking his collection. 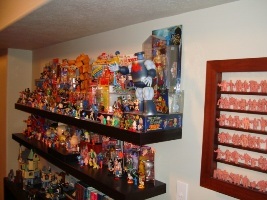 He simply takes a picture of his collection every time he adds a new piece. While he sometimes has a box or two hidden away, the pictures are actually quite easy for him to take. His collection resides on two seven foot display shelves, and a glass display case. 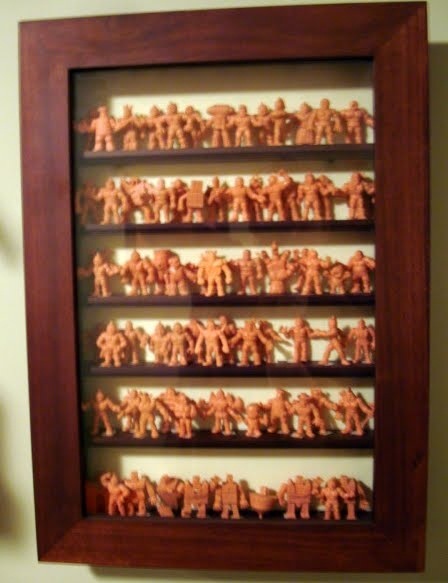 Tyler’s collection may be well organized, but it does not preclude him from injecting M.U.S.C.L.E. into other aspects of his life. He has M.U.S.C.L.E. figures in his office and a figure hanging from his rear view mirror. 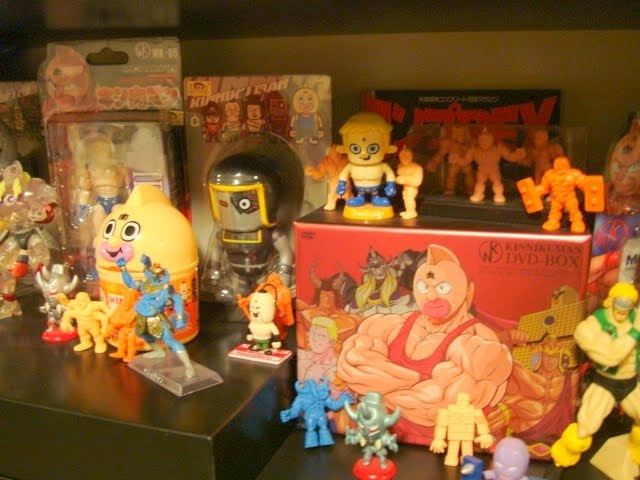 These few additional figures provide him a wonderful connection to anyone that feels some connection to M.U.S.C.L.E. figures. “I am reminded on a daily basis that I am part of the community. It amazes me how many times people come up to me at work, and say, ‘hey, I remember those guys!’ I find it a great segue to bring others back into the community. 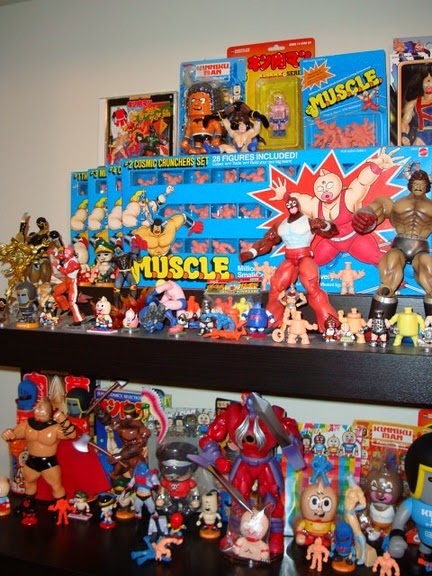 I say ‘back,’ because I think for the most part, all current MUSCLE collectors were also once collectors back in the 80s. 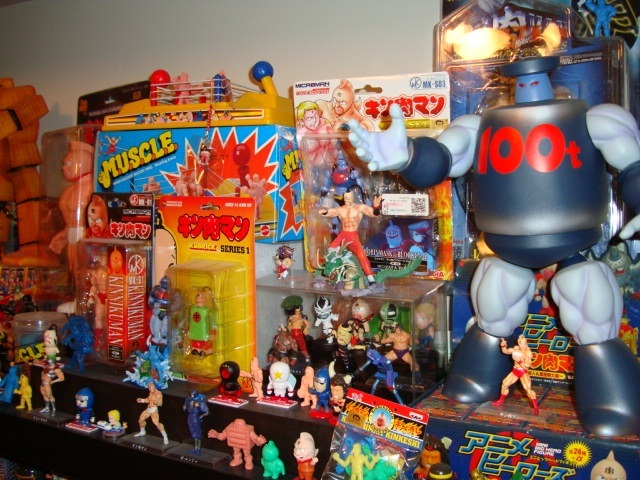 Thanks to Kinnikuman, M.U.S.C.L.E. will never fade away from Tyler’s consciousness. However he sees some things being necessary to keeping M.U.S.C.L.E. alive for other collectors. 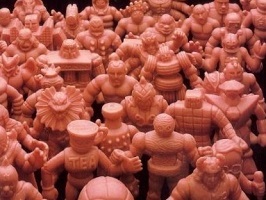 The entire M.U.S.C.L.E. community thanks Tyler for sharing his story! This entry was posted on Friday, July 30th, 2010 and is filed under Sociology, UofM News. You can follow any responses to this entry through RSS 2.0. You can skip to the end and leave a response. Pinging is currently not allowed. nice time machine 28 packs! Just found 140 of the little guys in a box. Am interested in learning about them. Looks like we found a few rare ones and several that are clearly made to look like 80s TV wrestlers including Hulk Hogan. Thanks for the web work ,,,It has made our quest to know more about what we uncovered today an interesting one. 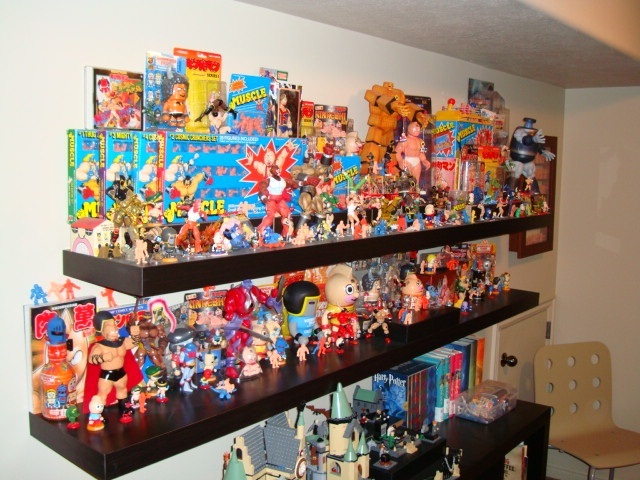 that is an awesome collection man! 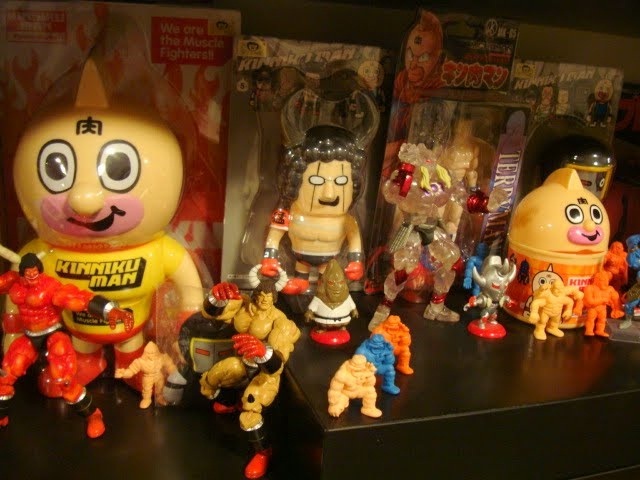 i love the very obvious kinnikuman inspired “big” figures. they are cool looking. nice job displaying them too.